Let the innovation begin! Our final cohort of 2016 just moved into the Boomtown offices and last week the seven teams met for the first time to learn from each other and begin their journey in the 12-week Boomtown accelerator program. This cohort is diverse in focus: three are healthtech companies, two are in fintech, one is B2B and one is in edtech. Four of the companies are from the Boulder/Denver area and other teams are from Fort Lauderdale and St. Louis. During the summer cohort, the Boomtown team experimented a lot and learned even more. For instance, the timing on when a new subject is introduced is crucial. Boomtown teams getting to work during week one! 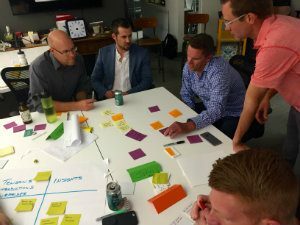 “If their heads are overwhelmed with other topics, important ideas and approaches can often be missed,” Erin Stadler, Boomtown program director, said in our summer cohort recap last month. We will see where the fall 2016 participants #GoFromHere as they work hard to develop their company. Demo Day is Tuesday, December 6 at the Boulder Theater. People can sign up on our website to be notified when tickets are available.